Photograph courtesy Phillip Moore Its August 16th 1984 and 25054 & 25213 have turned up at Leeds on the 1E23 10.40 Carlisle - Leeds service. The return working for this diagram was the 1M26 15.55 Leeds - Carlisle, Holbeck will use the same pair of Class 25s to make the working north over the Settle & Carlisle route. In this view the Class 25s head north with the 1M26. The southbound service would have worked into Leeds with most likely a Carlisle or Skipton crew, quite who is taking them north is not certain. The active career of D5204/25054 covered twenty one years and eleven months, allocated only to various London Midland Region depots. Livery: carried green livery with TOPS numbering (3/74 - 6/74 approx). Time between withdrawal & scrapping: 16 months. 25054 builders plate sold August 2004 on Ebay for GBP232.50. July 1963 to Cricklewood (14A). September 1963 to Cricklewood West (14B). January 1965 to London Midland (Midland Lines) LMML. January 1968 to Carlisle (12A). May 1968 to Stoke Division (D05). February 1972 to Manchester Division (D09). After withdrawal 25054 was stored at Crewe Gresty Lane. It was moved on January 24th 1986 with 25229 & 25256 as the 10.20am 9Z38 Crewe Gresty Lane – Doncaster Works and scrapped there by the middle of September 1986. Noted Derby Works July 1966. Noted Derby Works July 1974 (dual brake equipment fitted). Noted Derby Works May - July 1979 (Intermediate repair). Noted Derby Works April 1981 (N4 repair). Like a number of Class 25s, D5204/25054's first reported passenger working was on the summer dated Nottingham - Llandudno Town, working the round trip with 7582 on August 19th 1967. The next working was north of the border, on January 8th 1968 handling the 14.55 Edinburgh - Carlisle over the Waverley route. 5204 put in a strong performance on January 4th on the 09.00 Liverpool Exchange - Glasgow as far as Preston. With a heavily loaded seven coaches Preston was reached in under thirty three minutes, here 438 took over. On May 19th 5204 was back on the North Wales coast, working a Hampstead Heath - Llandudno Town day excursion out and back from Crewe. Photograph courtesy Tom Sutch 25054 shows off its old green livery at Springs Branch on April 1st 1974. The frame level white stripe has almost completely disappeared whilst the grey roof is mostly covered with exhaust. The gangway doors are also still in place. On May 11th 25054 & 25252 worked the 09.35 Cardiff - Manchester Piccadilly forward from Birmingham New Street. On July 16th 25054 rescued the 17.18 Kings Cross - Cleethorpes at Peterborough, taking the train on to Lincoln West Signalbox where 31314 took over. 25054 returned south from Lincoln to Peterborough as pilot locomotive to 31109 on the 20.05 Grimsby Town - Peterborough. And on August 10th 25054 & 25050 worked the 09.19 Manchester Piccadilly - Yarmouth to Lincoln Central, returning with the 09.15 ex-Yarmouth. The Royal Train was in use on March 18th taking Princess Anne from St Pancras to Bolton, powered by 25053 & 25054. 25054 & 25055 were on Royal Train duty on May 14th arriving at Kings Lynn with the stock for a late evening departure for the Duke of Edinburgh. The train ran to Salford via Peterborough, Grantham, Nottingham, Chesterfield, stopping overnight at Bamford. 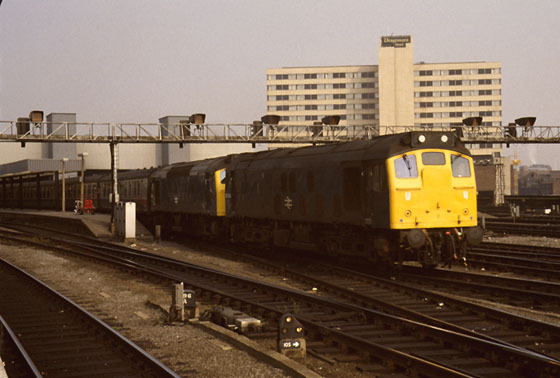 Only two workings have so far been recorded in 1975, on June 16th 25054 & 25120 worked a return Leamington Spa - Aberystwyth day excursion and on August 25th 25054 & 25129 worked a relief Nottingham - Skegness out and back. 1976 produced another Manchester Piccadilly - Lincoln Central (for Yarmouth) and return diagram, with the July 10th working handled by 25054 & 25257. Although the South Wales allocation of Class 25s had been greatly depleted earlier in the year, the Christmas break found three Class 25s stabled at area depots, with 25054 at Severn Tunnel Junction and 25055 & 25154 at Cardiff Canton. 25054 & 25220 were noted light engines at Cambridge on June 16th headed for March depot. May 27th saw 25054 & 25236 work the 08.52 Leicester - Skegness and the return 12.32 Skegness - Leicester as far as Nottingham. 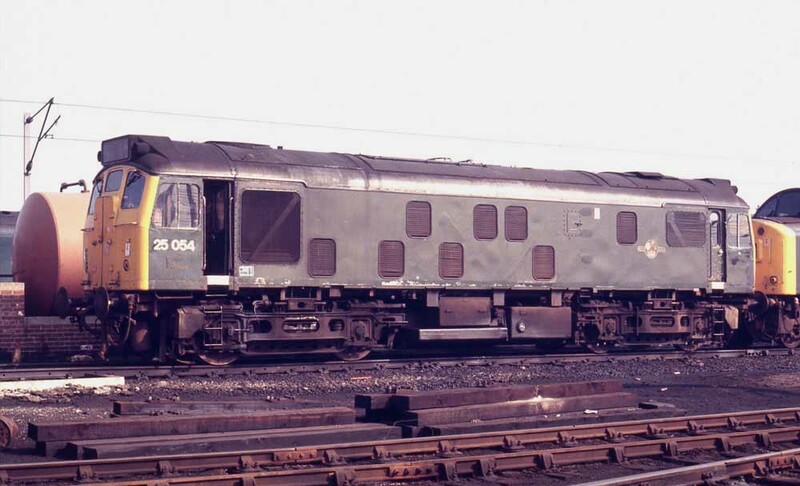 The seemingly ongoing shortage of Type 2 power in the London area found locomotives borrowed from distant depots with Eastfield’s 25235 & 25247 noted on local workings towards the end of August/beginning of September. Of course this shortage was partly created by the borrowing of Cricklewood’s allocation by other depots, 25054 was noted on Darlington’s local turns from September 3rd – 6th! Railtour duty on September 29th saw 25054 return the Anglian Explorer from Liverpool Street to Bletchley. 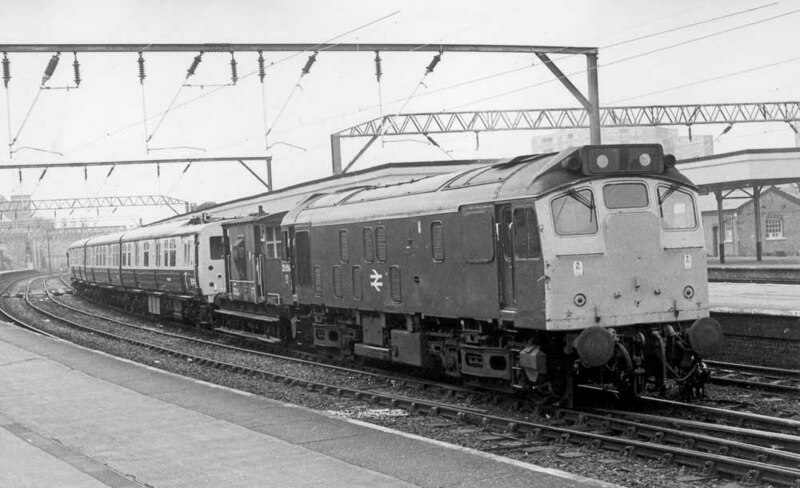 On March 21st 85006 failed at Hemel Hempstead with the 07.05 Glasgow - Euston service, 25054 assisted to Euston. On April 3rd (Maundy Thursday) 25222 & 25054 worked the 09.50 Nottingham - St Pancras relief. On April 6th a Leicester - Scarborough day excursion was worked by 25054 & 25222. The next day (7th) the same pair worked a Nottingham - Barry Island excursion, assuming both trips were worked throughout, a total of 623 miles were travelled. 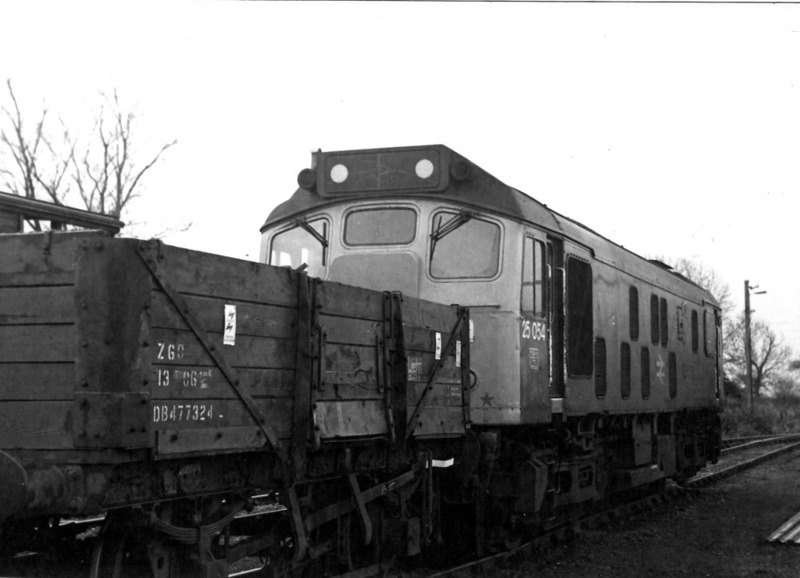 The continuing shortage of electric locomotives led to the novel use of pairs of Cricklewood’s Class 25’s on the heavy 20.55 Kensington Olympia – Stirling Motorail service. 25189 & 25054 worked up to Crewe on June 3rd & 4th, returning with the 23.40 ex Stirling motorail. 25054 & 25218 worked October 18th's 13.15 Birmingham New Street - Norwich throughout. Photograph courtesy David Smith Its November 27th 1980 and Dave is at Crewe Gresty Lane about to work 25054 and its train of spoil empties back to Nuneaton. The leading wagon certainly presents a picture of wear and tear through many years of service. 1981 saw a small varied selection of passenger workings. On May 10th 25054 & 25236 worked a Rugby - Portsmouth Harbour day excursion as far as Willesden, did they handle the return leg? A visit to the Cambrian line took place on September 19th when 25054 & 25218 worked the 04.10 Shrewsbury - Aberystwyth and the 10.07 Aberystwyth - Euston to Wolverhampton. The year closed with two workings in the north-west. On December 18th 25054 worked the 14.15 Manchester Victoria - Blackpool North followed by December 30th's 08.22 Barrow - Blackpool North. Photograph collection of webmaster An undated view of 25054 at Stockport with a Hadfield line electric multiple unit. All the remaining recorded passenger workings apart from one had a very north & north-west area bias. The odd man out occurred on June 5th when a Wigan N.W. - Wembley Central Schoolboy International football extra failed at Bletchley, here 25054 & 25206 were added to Wembley Central. On August 3rd 40029 & 25054 worked the Broughton Lane - Sheffield to Ditton BOC tankers. The two remaining passenger workings for 1982 involved the North Wales mainline. On August 10th 25054 worked the 10.15 Chester - Llandudno Town relief and on August 27th worked the 16.52 Bangor - Manchester Victoria. 1983 produced just one round trip - on June 6th 25054 worked the 09.50 Manchester Victoria - Blackpool North and the 12.45 return(?). On April 25th (?) 25054 was noted at Hereford with a lengthy and delayed afternoon freight from Carlisle. Whilst at Hereford it was combined with a freight hauled by 40004, both locomotives taking the combined train forward to Severn Tunnel Junction. On May 12th 25054 was noted running through Chester with an engineers working. North-west area workings in 1984 produced the 16.20 Glasgow Central - Liverpool from Preston on June 1st, 4th and August 22nd. On August 16th 25054 worked the 10.40 Carlisle - Leeds with 25213, and the return 15.55 ex-Leeds. 25054 was back on the Settle & Carlisle on August 20th 1984 rescuing a 'Northern Belle' steam railtour, when N15 30777 Sir Lamiel failed, 25054 & 25209 took the train from Appleby to Leeds. Two days later (20th) 25054 returned to the 16.20 Glasgow Central - Liverpool from Preston, remaining in the area on 23rd to work the 06.30 Preston - Barrow and the 08.20 Barrow - Liverpool. 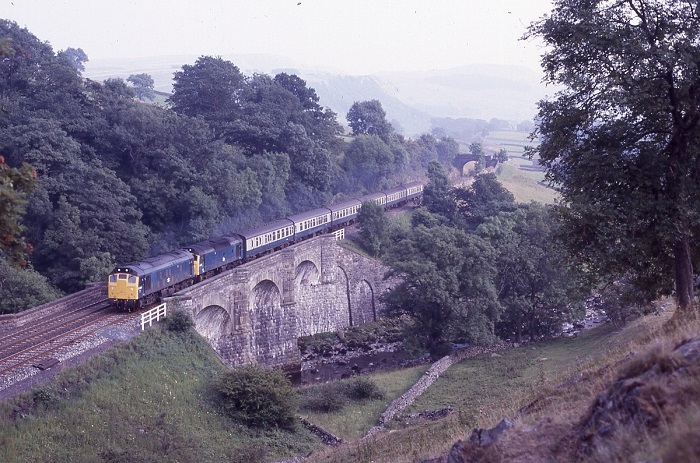 Photograph collection of webmaster 25054 & 25213 cross the River Ribble between Stainforth & Helwith Bridge working the above mentioned 15.55 Leeds - Carlisle. The final recorded passenger working for 25054 took place on February 1st with 25044 working the 07.25 Glasgow Central - Carlisle. On February 1st the APT moved from Polmadie to Thornaby for wheel turning, being noted through Hexham behind 25044 & 25054, returning on 4th behind the same locomotives. 25054 was withdrawn on May 12th 1985. Page added May 5th 2013. Last updated January 26th 2019.